"There are three types of people: those who can count, and those who can't." The expression of numerical quantities is something we tend to take for granted. This is both a good and a bad thing in the study of electronics. It is good, in that we're accustomed to the use and manipulation of numbers for the many calculations used in analyzing electronic circuits. On the other hand, the particular system of notation we've been taught from grade school onward is not the system used internally in modern electronic computing devices, and learning any different system of notation requires some re-examination of deeply ingrained assumptions. WHOLE NUMBERS:1, 2, 3, 4, 5, 6, 7, 8, 9 . . .
INTEGERS:-4, -3, -2, -1, 0, 1, 2, 3, 4 . . . Different types of numbers find different application in the physical world. Whole numbers work well for counting discrete objects, such as the number of resistors in a circuit. Integers are needed when negative equivalents of whole numbers are required. Irrational numbers are numbers that cannot be exactly expressed as the ratio of two integers, and the ratio of a perfect circle's circumference to its diameter (π) is a good physical example of this. The non-integer quantities of voltage, current, and resistance that we're used to dealing with in DC circuits can be expressed as real numbers, in either fractional or decimal form. For AC circuit analysis, however, real numbers fail to capture the dual essence of magnitude and phase angle, and so we turn to the use of complex numbers in either rectangular or polar form. If we are to use numbers to understand processes in the physical world, make scientific predictions, or balance our checkbooks, we must have a way of symbolically denoting them. In other words, we may know how much money we have in our checking account, but to keep record of it we need to have some system worked out to symbolize that quantity on paper, or in some other kind of form for record-keeping and tracking. There are two basic ways we can do this: analog and digital. With analog representation, the quantity is symbolized in a way that is infinitely divisible. With digital representation, the quantity is symbolized in a way that is discretely packaged. You're probably already familiar with an analog representation of money, and didn't realize it for what it was. 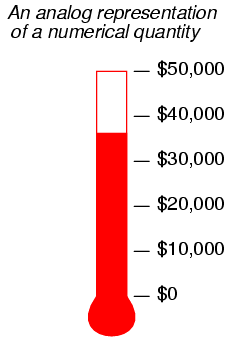 Have you ever seen a fund-raising poster made with a picture of a thermometer on it, where the height of the red column indicated the amount of money collected for the cause? The more money collected, the taller the column of red ink on the poster. This is an example of an analog representation of a number. There is no real limit to how finely divided the height of that column can be made to symbolize the amount of money in the account. Changing the height of that column is something that can be done without changing the essential nature of what it is. Length is a physical quantity that can be divided as small as you would like, with no practical limit. The slide rule is a mechanical device that uses the very same physical quantity -- length -- to represent numbers, and to help perform arithmetical operations with two or more numbers at a time. It, too, is an analog device. Interpretation of numerical symbols is something we tend to take for granted, because it has been taught to us for many years. However, if you were to try to communicate a quantity of something to a person ignorant of decimal numerals, that person could still understand the simple thermometer chart! The infinitely divisible vs. discrete and precision comparisons are really flip-sides of the same coin. The fact that digital representation is composed of individual, discrete symbols (decimal digits and abacus beads) necessarily means that it will be able to symbolize quantities in precise steps. On the other hand, an analog representation (such as a slide rule's length) is not composed of individual steps, but rather a continuous range of motion. The ability for a slide rule to characterize a numerical quantity to infinite resolution is a trade-off for imprecision. If a slide rule is bumped, an error will be introduced into the representation of the number that was "entered" into it. 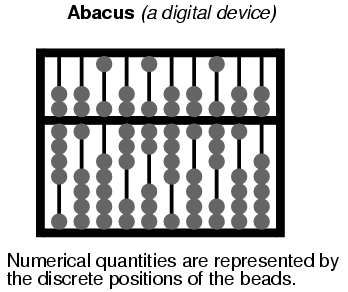 However, an abacus must be bumped much harder before its beads are completely dislodged from their places (sufficient to represent a different number). Please don't misunderstand this difference in precision by thinking that digital representation is necessarily more accurate than analog. Just because a clock is digital doesn't mean that it will always read time more accurately than an analog clock, it just means that the interpretation of its display is less ambiguous. 3.1415926535897932384 . . . . . It is possible, at least theoretically, to set a slide rule (or even a thermometer column) so as to perfectly represent the number π, because analog symbols have no minimum limit to the degree that they can be increased or decreased. If my slide rule shows a figure of 3.141593 instead of 3.141592654, I can bump the slide just a bit more (or less) to get it closer yet. However, with digital representation, such as with an abacus, I would need additional rods (place holders, or digits) to represent π to further degrees of precision. An abacus with 10 rods simply cannot represent any more than 10 digits worth of the number π, no matter how I set the beads. To perfectly represent π, an abacus would have to have an infinite number of beads and rods! The tradeoff, of course, is the practical limitation to adjusting, and reading, analog symbols. Practically speaking, one cannot read a slide rule's scale to the 10th digit of precision, because the marks on the scale are too coarse and human vision is too limited. An abacus, on the other hand, can be set and read with no interpretational errors at all. Furthermore, analog symbols require some kind of standard by which they can be compared for precise interpretation. Slide rules have markings printed along the length of the slides to translate length into standard quantities. Even the thermometer chart has numerals written along its height to show how much money (in dollars) the red column represents for any given amount of height. Imagine if we all tried to communicate simple numbers to each other by spacing our hands apart varying distances. The number 1 might be signified by holding our hands 1 inch apart, the number 2 with 2 inches, and so on. If someone held their hands 17 inches apart to represent the number 17, would everyone around them be able to immediately and accurately interpret that distance as 17? Probably not. Some would guess short (15 or 16) and some would guess long (18 or 19). Of course, fishermen who brag about their catches don't mind overestimations in quantity! For large numbers, though, the "hash mark" numeration system is too inefficient. Aren't you glad we don't use this system of numeration? Large numbers are very difficult to denote this way, and the left vs. right / subtraction vs. addition of values can be very confusing, too. Another major problem with this system is that there is no provision for representing the number zero or negative numbers, both very important concepts in mathematics. Roman culture, however, was more pragmatic with respect to mathematics than most, choosing only to develop their numeration system as far as it was necessary for use in daily life. We owe one of the most important ideas in numeration to the ancient Babylonians, who were the first (as far as we know) to develop the concept of cipher position, or place value, in representing larger numbers. Instead of inventing new ciphers to represent larger numbers, as the Romans did, they re-used the same ciphers, placing them in different positions from right to left. Our own decimal numeration system uses this concept, with only ten ciphers (0, 1, 2, 3, 4, 5, 6, 7, 8, and 9) used in "weighted" positions to represent very large and very small numbers. Each cipher is called a digit in the decimal numeration system, and each weight, or place value, is ten times that of the one to the immediate right. So, we have a ones place, a tens place, a hundreds place, a thousands place, and so on, working from right to left. Right about now, you're probably wondering why I'm laboring to describe the obvious. Who needs to be told how decimal numeration works, after you've studied math as advanced as algebra and trigonometry? The reason is to better understand other numeration systems, by first knowing the how's and why's of the one you're already used to. The decimal numeration system uses ten ciphers, and place-weights that are multiples of ten. What if we made a numeration system with the same strategy of weighted places, except with fewer or more ciphers? This can get quite confusing, as I've written a number with binary numeration (11010), and then shown its place values and total in standard, decimal numeration form (16 + 8 + 2 = 26). In the above example, we're mixing two different kinds of numerical notation. To avoid unnecessary confusion, we have to denote which form of numeration we're using when we write (or type!). Typically, this is done in subscript form, with a "2" for binary and a "10" for decimal, so the binary number 110102 is equal to the decimal number 2610. The subscripts are not mathematical operation symbols like superscripts (exponents) are. All they do is indicate what system of numeration we're using when we write these symbols for other people to read. If you see "310", all this means is the number three written using decimal numeration. However, if you see "310", this means something completely different: three to the tenth power (59,049). As usual, if no subscript is shown, the cipher(s) are assumed to be representing a decimal number. Commonly, the number of cipher types (and therefore, the place-value multiplier) used in a numeration system is called that system's base. Binary is referred to as "base two" numeration, and decimal as "base ten." Additionally, we refer to each cipher position in binary as a bit rather than the familiar word digit used in the decimal system. Now, why would anyone use binary numeration? The decimal system, with its ten ciphers, makes a lot of sense, being that we have ten fingers on which to count between our two hands. (It is interesting that some ancient central American cultures used numeration systems with a base of twenty. Presumably, they used both fingers and toes to count!!). But the primary reason that the binary numeration system is used in modern electronic computers is because of the ease of representing two cipher states (0 and 1) electronically. With relatively simple circuitry, we can perform mathematical operations on binary numbers by representing each bit of the numbers by a circuit which is either on (current) or off (no current). Just like the abacus with each rod representing another decimal digit, we simply add more circuits to give us more bits to symbolize larger numbers. Binary numeration also lends itself well to the storage and retrieval of numerical information: on magnetic tape (spots of iron oxide on the tape either being magnetized for a binary "1" or demagnetized for a binary "0"), optical disks (a laser-burned pit in the aluminum foil representing a binary "1" and an unburned spot representing a binary "0"), or a variety of other media types. Before we go on to learning exactly how all this is done in digital circuitry, we need to become more familiar with binary and other associated systems of numeration. Because binary numeration requires so many bits to represent relatively small numbers compared to the economy of the decimal system, analyzing the numerical states inside of digital electronic circuitry can be a tedious task. Computer programmers who design sequences of number codes instructing a computer what to do would have a very difficult task if they were forced to work with nothing but long strings of 1's and 0's, the "native language" of any digital circuit. To make it easier for human engineers, technicians, and programmers to "speak" this language of the digital world, other systems of place-weighted numeration have been made which are very easy to convert to and from binary. One of those numeration systems is called octal, because it is a place-weighted system with a base of eight. Valid ciphers include the symbols 0, 1, 2, 3, 4, 5, 6, and 7. Each place weight differs from the one next to it by a factor of eight. Another system is called hexadecimal, because it is a place-weighted system with a base of sixteen. Valid ciphers include the normal decimal symbols 0, 1, 2, 3, 4, 5, 6, 7, 8, and 9, plus six alphabetical characters A, B, C, D, E, and F, to make a total of sixteen. As you might have guessed already, each place weight differs from the one before it by a factor of sixteen. Likewise, the conversion from either octal or hexadecimal to binary is done by taking each octal or hexadecimal digit and converting it to its equivalent binary (3 or 4 bit) group, then putting all the binary bit groups together. Incidentally, hexadecimal notation is more popular, because binary bit groupings in digital equipment are commonly multiples of eight (8, 16, 32, 64, and 128 bit), which are also multiples of 4. Octal, being based on binary bit groups of 3, doesn't work out evenly with those common bit group sizings. Although the prime intent of octal and hexadecimal numeration systems is for the "shorthand" representation of binary numbers in digital electronics, we sometimes have the need to convert from either of those systems to decimal form. Of course, we could simply convert the hexadecimal or octal format to binary, then convert from binary to decimal, since we already know how to do both, but we can also convert directly. These basic techniques may be used to convert a numerical notation of any base into decimal form, if you know the value of that numeration system's base. Because octal and hexadecimal numeration systems have bases that are multiples of binary (base 2), conversion back and forth between either hexadecimal or octal and binary is very easy. Also, because we are so familiar with the decimal system, converting binary, octal, or hexadecimal to decimal form is relatively easy (simply add up the products of cipher values and place-weights). However, conversion from decimal to any of these "strange" numeration systems is a different matter. Well, we know that we won't have a "1" bit in the 128's place, because that would immediately give us a value greater than 87. However, since the next weight to the right (64) is less than 87, we know that we must have a "1" there. A cipher value of "3" in the 8's place would put us over the desired total of 8710, so "2" it is! Can we do decimal-to-hexadecimal conversion the same way? Sure, but who would want to? This method is simple to understand, but laborious to carry out. There is another way to do these conversions, which is essentially the same (mathematically), but easier to accomplish.